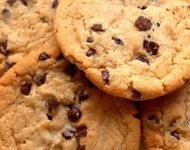 Hands down...this is my favorite chocolate chip cookies recipe! They come out soft and chewy. If you want them chewy and not hard, use a nonstick silicone baking mat for even browning. (no burnt bottoms). These cookies also freeze really well, so feel free to bake up an extra batch and freeze them for later use. Preheat oven to 375 degrees F. In a small mixing bowl, combine first 3 ingredients and set aside. In a large mixing bowl, cream butter and sugars together until fluffy. Add vanilla and eggs. Beat well. Sift dry ingredients to cream mixture. Mix well. Stir in chocolate chips by hand. Take heaping tablespoons of dough and roll into a ball. Place each ball 2" apart on a cookie sheet lined with a nonstick silicone baking mat. (Tupperware has awesome silicone baking mats). Bake for 8-10 minutes. Remove cookies from oven, place on cooling rack. Store in an airtight canister. Makes approximately 3 1/2 dozen of cookies.